Anna Richland » Win a Free Paperback! 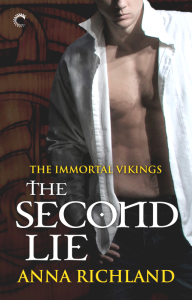 I’m giving away three paperback copies of The Second Lie (Immortal Vikings #2) through Goodreads. This is a paranormal romantic suspense featuring Stig, an Immortal Viking thief who tries to pull a scam on the wrong woman. Christina has secrets of her own, and she’s not going to be a victim of a con. Clicking on the cover should go to Goodreads where you can sign up before the contest ends on November 30!